We sell high quality Natural Wood sand trays, unstained Maple sand trays, and Jungian sand trays at a reasonable price. These wooden sand trays are made to last. High quality paint and clear acrylic ensures that the sand will not easily wear out the wood's protection. The measurements are 19 inches by 28 inches. They are three and three/fourths inches deep. While some therapists use any container for a sand box or sand tray, try the extra advantage of a professionally built sand tray. All of our sand trays will hold water. For those unfamiliar with sand trays, we will attempt to provide a brief description. Simply described, a sand tray is a small sand box designed for indoor use. Sand trays are used in working with children and sometimes adults. Participants may have a variety of diagnoses, but sand tray therapy is probably most often used with children who have been traumatized. They are also used as an adjunct to other techniques. For sand tray therapy, additional equipment includes a wide variety of toys, and high quality sand. Some therapists use wet sand, but high quality dry sand is also effective. Carl Jung theorized that the moisture in the sand, the colors of the box, and the wide variety of toys, help the child go into a slight trance to tap the child's unconscious processes. Most therapists use sand tray therapy to assess the child's current dilemmas and help the child resolve them. Sand tray techniques are thoroughly described in Images of the Self: The Sandplay Therapy Process by Estelle L. Weinrib. We can offer our quality sand trays for $135.00 plus shipping. Shipping and handling cost $30.00. The total cost cost of a natural sand tray without a lid is $165.00. Most professionals want a lid for their sand tray. We can build you one for $20.00 with an additional $5.00 for shipping and handling. Thus for shippng and handling of a sand tray with a lid, the total cost is $185.00. to get the sand tray made from Maple, just add $20.00. We can not guarentee that the lid and the bottom is made out of maple, but check our pictue to see if you think it matches well. If you have any questions about the pricing, please feel free to send us an E-mail. Please note that sand is not included. If you can not find quality sand in your area, we can obtain sand for you. However, due to the costs of shipping, it would be less expensive for you to purchase sand in your area. It is very important that you purchase a fine grade sand often sold at hardware outlets as "playsand". Gritty sand or sand of inferior quality can be distracting to the child. To order your own Naural Wood Sand Tray, please send a check or money order payable to Your Family Clinic. Our address is Your Family Clinic, 67 Mars Hill Road, Petal, MS 39465. Please also include your name, address, E-mail address and phone number. Make sure you let us know which sand tray you prefer. Another way to order your sand tray is through Paypal. To order a sandtray with a lid, click on the Paypal graphic. As of 12 February 2019, we have three Sand Trays ready to ship. We have a maple sand tray with the inside sides painted blue, a maple sand tray with out the inside sides painted blue (natural maple color) and a Jugian sand tray. All are ready to ship with or without a lid. Our sand trays come without handles on the lids, but if you request in advance, we can put a handle on it. The advantage of not having a handle is that it is easier to stack other things on the sand tray. The sand tray's lid will easily open without a handle. We also can make trays according to your specifications. Alaska, Hawaii, Canada and all other countries, please ask for shipping costs via E-mail. Sometimes shipping can cost more that $100.00 outside the Continental U.S..
Also please E-mail us at The Family Clinic so we can be looking for your letter. If you have any questions or concerns, please let us know. Below is a photograph of one of our natural sand trays. The natural wood markings will be different on your sand tray. To view photographs of our Jungian Sand Trays, just click here. 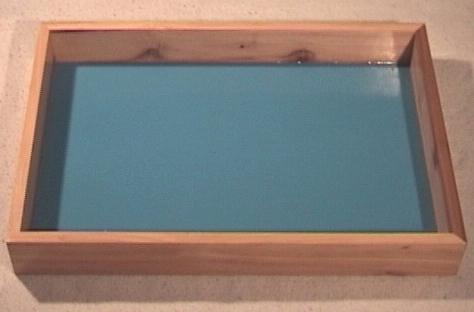 In real life the Natural Wood Sand Tray's blue bottom is a little brighter and deeper color than this picture shows. Link to a site that will allow you to order toys: Sandplay-toys.